Pokemon Leaf Green is a new adventure in the Pokemon world, set in the calssic Kanto region where Pokemon first took root and exploded. You'll become an 11-year-old boy or girl, starting a journey from Pallet Town to become a master Pokemon trainer. Professor Oak has given you a Pokedex to aid you, as you catch, raise and train Pokemon for battle. Battle across games as you face Pokemon from otehr games -- and do it wirelessly, for freedom of movement while you play! You can also exchange game challenges, talk battle strategy or just shoot the breeze with up to five people in a chat session - or send text messages to other trainers in the Union Rooms. This page provides an overview of Pokemon Leaf Green, and provides a small selection of links to places where you can find cheats, game guides, and reviews. 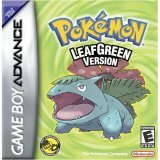 If available, you can find many additional cheats, guides, and reviews for Pokemon Leaf Green by using the tabs above. We have cheats for Pokemon Leaf Green, and know of 5 other websites with cheats. We have 1 user reviews of Pokemon Leaf Green.